We've had several people ask for an easier way to print the recipes off our website. Guess what? We were listening and looking for a solution. We've finally found a way to make the recipes we share on our site a whole lot more printer friendly. From here forward you'll notice a difference in the format of our recipes, especially the command bar located right above the ingredients list. From this bar you can print off the recipe, e-mail it to your self or a friend, and you can even text it to your phone - if you're one of those that likes to have an ingredients list on your phone when your shopping. Or maybe you want to pin the recipe to your Pinterest board? Tweet a link to your followers or share the recipe with your Facebook Friends? We've made it super simple for you to do that with the social media buttons - just use the buttons to pin, tweet or share the recipe. As we mentioned, going forward all of our new recipes will have this command bar for you to use. We will gradually be converting recipes in the archives to the new format so that the most popular, our favorite and all of the cookie mix recipes will be simple to print and share. You'll also want to check out our Recipe Index Page, as it's gotten a face lift too! Not only does it have pretty pictures, but you can search for your favorite recipes a few different ways. There's a good ol' search bar - type in what you're looking for and get a list of results. You can browse the recipes by what Joseph's Grainery product it uses or by what type of recipe it is (entree, dessert, breakfast, etc). You can also look for your favorite recipes using the alphabetical index. Now you know why we haven't been in the kitchen whipping up something tastey...we've been slaving away in front of the computer screen. 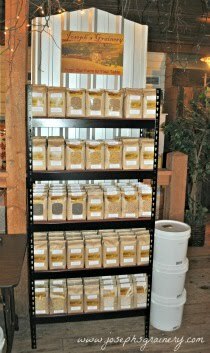 We hope that all of these improvements make finding, printing and sharing the recipes for Joseph's Grainery products a little easier to do, so you'll want to spend more time in the kitchen cooking and baking with our Whole Grain Products.